Welcome to The Abso!ute Sound online! We explore music and the reproduction of music in the home. We believe that the sound of music, unamplified, occurring in a real space is a philosophic absolute against which we may judge the performance of devices designed to reproduce music. Our goal is to provide the resources consumers need to judge how a component's sound either honors or departs from the music's truth, and to make sound purchasing decisions that maximize their experience of reproduced sound. Below is our Issue 187, Winter 2008 / Spring 2009 Buyer's Guide contents and editorial. A brief but authoritative history of our hobby by TAS editor-in-chief Robert Harley. Personal recollections of life as budding audiophiles from Jonathan Valin, Neil Gader, Robert Harley, and Wayne Garcia. 25 How You can get Started in High-End Audio	Robert Harley walks you through how to allocate your audio budget; select, match, and upgrade components for your system; and establish a relationship with a dealer. 38 What Would you Buy? Four Ways of Building a $5000 System	Four guys, four rooms, and four different musical and listening biases yield four different ways of building a $5000 system. Real-world choices by Neil Gader, Jonathan Valin, Wayne Garcia, and Robert Harley. Steven Stone explains high-resolution downloads and how they work; what's great, and what's not, about iPods (and how to get the most from one); how to rig a wireless home; and the low-down on Apple's Airport Extreme and TV, Logitech's Squeezebox Duet, and Wadia's 170 iTransport iPod Dock. Desktop speakers, iPod speaker systems, earbuds, and headphones. 70 Loudspeakers	Stand-mounted, floorstanding, planar, and subwoofers. 90 LP Playback	Integrated and stand-alone turntables, tonearms, cartridges, and phonostages. 108 Disc Players	Integrated CD players and CD/high-res disc-spinners. 118 Integrated Amplifiers: Solid-state and tube. 124 Preamplifiers:	Solid-state and tube. 129 Power Amplifiers:	Solid-state and tube. Our staff picks 50 of the finest and finest sounding titles in each category. Loudspeakers, turntables, tonearms, cartridges, phonostages, disc players, digital separates, integrated amplifiers, solid-state and tube preamps and amps, cables, and accessories. The priciest, sexiest, and best-sounding objects of audio desire. Jonathan Valin, our resident expert on the extremely high High End, ushers you into a world where if you have to ask how much it costs, you can't afford it. 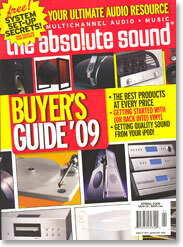 The 12 Greatest Bargains in High-End Audio... and where to read about them in this issue.